Jay Z's Budweiser Made in America Festival is all set for the upcoming Labor Day weekend. The sold out fest will be held on Saturday and Sunday September 5th and 6th on the Benjamin Franklin Parkway near the Art Museum. On Monday, organizers released the long awaited schedule with set times for the previously confirmed artists. Beyonce will headline on Saturday night and The Weeknd will close out on Sunday night. The lineup as a whole is a diverse mix of hip hop, r&b, indie, rock, and edm acts that will give attendees a taste of everything. 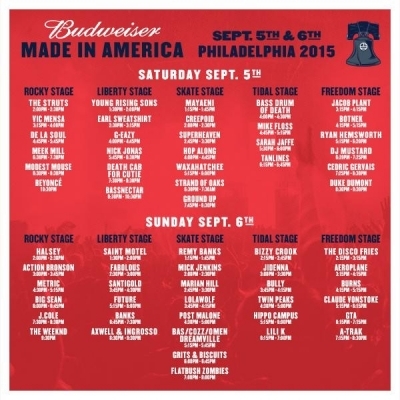 Made in America is also providing a great platform to showcase Philadelphia talent during the weekend. Philly-bred artists Meek Mill and Santigold will be returning home to play featured spots on the main stages. However, there are more than a handful of excellent local and regional level bands from Philadelphia that are lined up on the Skate Stage that you shouldn't miss. Saturday is the big day for Philly local acts. Starting at 2pm check out punk/grunge rockers Creepoid. Next up will be rock group Superheaven from Doylestown. Hop Along, led by the powerful vocals of Frances Quinlan, will stop you in your tracks. Next, Katie Crutchfield's indie rock project Waxahatchee will be perfect in the late afternoon. Strand of Oaks' 2014 album HEAL was one of the most critically acclaimed albums of the year. SOO creator singer/songwriter Timothy Showalter's live rock performances are powerful and emotional. Finally to finish Saturday will be dynamic hip hop trio GroundUp. On Sunday, Marian Hill will take the Skate Stage and bring their minimal beats, silky vocals, and sax known to create the infectious groove in many Vines and You Tube videos. Keep these Philly Locals in mind as you are walking around the festival. Stop and listen in for a minute if you get the chance. They are some of the best in Philadelphia right now, plus you'll be able to catch them sometime in the area soon if you like what you hear.